Versatile actor Dr. Mohan Babu’s ‘Gayatri’ has been scheduled for release on February 9th. Final schedule of shooting has been wrapped up today at Ramanaidu Studios. Post-production works are progressing at rapid pace. Gayatri is directed by Madan. Vishnu Manchu will be appearing in a powerful role and Shriya will be seen opposite him. Recently, the film’s team shot crucial scenes on Vishnu and Shriya at Ramoji Film City. Nikhila Vimal is playing the titular role of ‘Gayatri’. Successful music director SS. Thaman has composed music for this film and busy with re-recording. Brahmanandam and Anasuya Bharadwaj will be seen in other key roles. 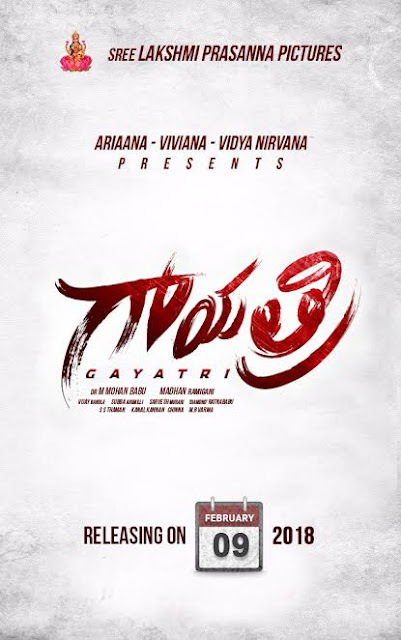 ‘Gayatri’ is produced by Mohan Babu under his prestigious banner, Sree Lakshmi Prasanna Pictures while Ariaana, Viviana and Vidya Nirvana are presenting the film. ‘Gayatri’ is all set for grand release on February 9th.